Description : Flash Element TD is a tower defense games, very classic games. The game had been played over 140 million times as of March 2009. 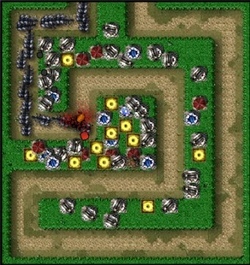 The aim of the game is to kill the creeps before they reach the end of the maze, Flash Element do this by building attacking towers on the grass around the maze. To build click on the one you want to build on the right, then click on the map where you want it to be built. Once built you can click on them to upgrade or sell. All the towers that you buy have different abilities, damage, and ranges and can also be upgraded.